Can you tell me wich letters are in each circle of the Trinity shield? (The proper abreviations used in Latin fo Pater, Filius et Spiritus? 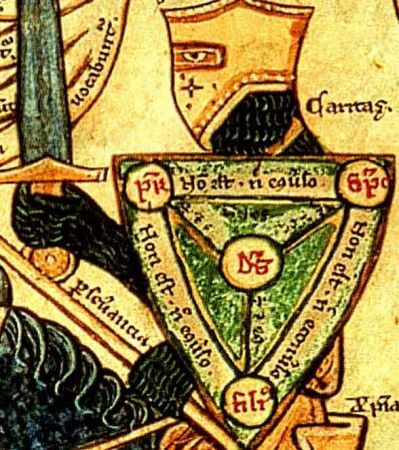 Do you know if any knight ever carried a shield (Scutum Fidei) like this into battle? Since this is not the first time i have seen the Trinity, in such way, there is an Italian woodcut too.